I created a digitized dataset of Cleveland’s historical land annexations and it didn’t exist before. Thanks to this data set, I was able to make this time-lapse map displaying the growth of Cleveland’s historic annexations and additional research can more easily be done. More below on what I learned, why I did it, what else can be done with this new data set. As a part of my day job as a web developer at the local library, I met with Marty, the City of Cleveland Archivist, about an unrelated issue with the Cleveland Public Library website. He graciously gave me a tour of the City Archives across from the Justice Center in Downtown Cleveland. He had large copy (2 x 3 foot) of an annexation map from 1968 on the wall and often referenced it for city employees. I’ve been a fan of maps and he mentioned in passing that since that map’s publishing, there have been additional annexations but no map has been made since then*** and no one had the time or resources to do it. (Just in early 2019, I found an annexation map on made in wikipedia made around 2010 by Paul J Meissner but I haven’t been able to contact him or obtain it in a higher resolution. Additionally, that map appears to use Google which goes against Google’s Terms and Conditions and is not on very firm ground to be legally shared. Aloud to Marty, “I could make you a newer print map with those annexations”, I offered to make one (I’m still working on it). To make a new print map, you would need the annexation boundaries data set first. That data set didn’t exist, until now. How much of Cleveland's population growth in the 19th and 20th century can be attributed by annexating other places? Did Cleveland's population grow at the same proportion in the 20th century as its size? Did proposed or implemented annexations had any influence on development patterns or migration patterns for residents in the 19th and 20th century? I’m also casually interested in how past city decisions influence our present day. How would Cleveland and Northeast Ohio would be different if certain areas were never annexed or annexed at a later date (or certain places that were once considered for annexation, like East Cleveland and Lakewood, were annexed). In the process of creating these boundaries, a scholar had contacted the Cleveland Public Library with a research question seeking the historical Cleveland boundaries (!) (I found out through my day job) and I was able to provide him with some of my data. These boundaries can also be used as the basis for a new printed map of Cleveland annexations. Through my years in open data advocacy and mapmaking, I hadn’t known much about available past, open accessible historic geospatial data. Historic geo data generally wasn’t included in municipal open data portals. Before this project, I hadn’t known of any historical annexation boundaries to exist but Karl Phillips has been doing prolific work on digitizing historic annexation boundaries and had been putting his annexation boundaries up on mapstory (a neat site in its own right) although you won’t find them there right now; mapstory redesigned their site and deleted some of the existing work. Karl told me he’s planning on reuploading them to mapstory. Reach out to him at Phillips AT MapStory dot org. In addition, this project may be used to get myself and others more attention to the question of who should store historic geospatial data (and how). I discuss in an earlier post why public libraries can be great places to host and curate civic data (domain expertise of subjects, community understanding/trust as a place to get knowledge in a way that doesn’t feel as stuffy or intimidating as an academic library would, and a 3rd party source [generally] outside of direct municipal government control). I’ve talked with some co-workers on how that our data set can be something that we can be the steward at the library; we haven’t stored any geospatial data just yet, and to my knowledge, no or very few public libraries do yet (Maybe I’m running in the wrong circles; I’d like to know where). That means we have to set up the resources to host it and and our current digital system doesn’t store geographic data and I’d also have to figure out how other binary data sources should be stored. This is not an insignificant question. Something I’m looking forward to figuring out and hear you opinions. Many public libraries may not have the infrastructure or technical knowledge to do this; so maybe this is something that occurs in collaboration across multiple libraries, ala DPLA. The geographic data set is currently available as Shapefiles and geojson at my github repository of Cleveland Boundaries, cleboundaries where the metadata and additional notes are also located to understand the data. The data set as of this writing is not yet complete. There are several annexations from the 2nd half of the 20th century that need to be added, especially around the Cleveland International Airport. I’d like to have a consistent way of determining annexations’ “start dates”. Should it be when the annexation was passed in legislation or when it was effective ‘on the street’? When acknowledged/recorded by the state or county? As I far as I know, all of these dates vary. The process of georectification isn’t easy, so I think there’s some value in writing this out. I’ll breifly outline how I created these polygons. Maps that are images (not ‘web maps’ like google maps) or paper maps scanned into a computer cannot be overlaid a web map with georectification. 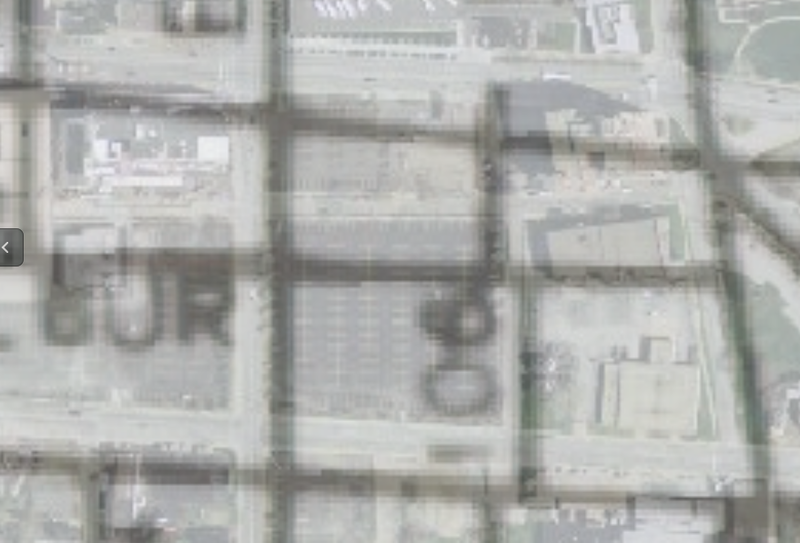 When you first scan a paper map into a computer, there’s no information within the image that tells the computer “this portion of the image” is in Cleveland, Ohio (or any another particular place). Very broadly, this absence of context is similar to when you scan a paper document, you cannot immediately select the text on it. You can visually see with your eyes what the words say; but computer software only knows that there are black and white shapes there; computer software does not known those shapes also represent characters of a language. Lincoln Mullen does a great job of explaining the overall process of georectification. When I first started the project, I planned to create the geographic shapes by first georectiying what I dubbed the 1968 map, a hand-drawn map by the City Engineering and Construction Dept. that is the most recently published version of a map with the boundaries. Then, I would create the shapes by tracing over the georectified map. I first tried georeferencing the 1968 map on mapwarper.net; a great free, open-source tool (although he deserves some $ for this, but I digress); and used OpenStreetMap as the reference map. After making over 20 reference points with the 1968 map in mapwarper.net, I found that many places in the 1968 georeferenced map it still didn’t match up well with my reference map; In many places, I was getting only about 30-40 meter accuracy. As shown in the image below, the black lines representing streets from the 1968 map; with aerial imagery from state of Ohio imagery (circa 2015) as the referenced map. I came to the conclusion that the 1968 map wasn’t drawn very consistently. It was hand-drawn somewhat poorly and that I could not merely trace over the georeferenced 1968 map. I couldn’t rely primarily rely on that. At this point, I also began relying primarily on TIGER and the state of Ohio’s aerial imagery, to eliminate any copyright restrictions (which would have occurred if I would continue using OpenStreetMap) on my data set. Instead, I had to use the 1968 map and the Volkmann map as sort of a guide: Look at a particular polygon in the 1968 map and volkmann map by identifying them on one of the maps(thinking my mind, “oh, western border of this polygon is a house-worth’s east of east 156th”, then open up the TIGER/State of Ohio imagery and draw it in the same location. So, on and off, over a few months on idle Saturdays, I drew the polygons. At one point, I stopped because I wasn’t sure which dates to use in the source data as ‘actual date of when annexations were implemented’ and that discouraged me for a few months. 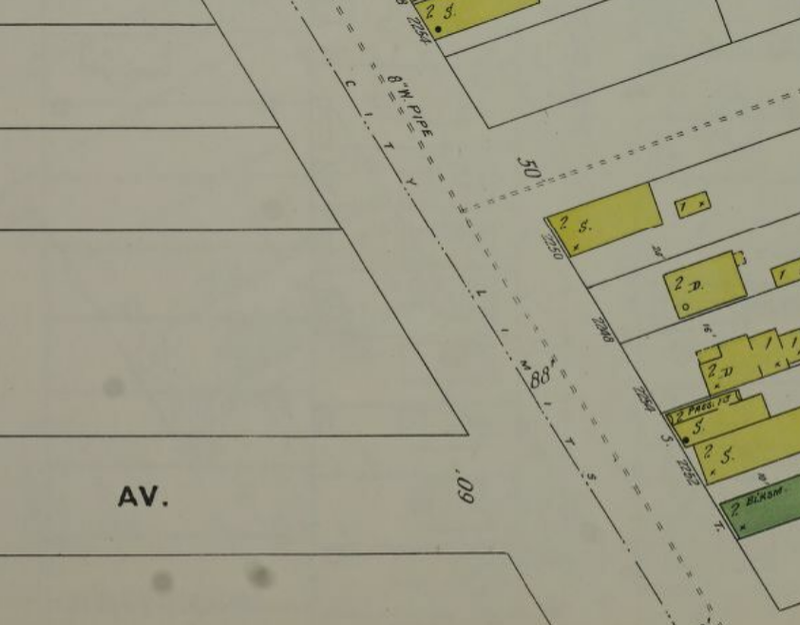 Not until a few months in the process, I realized that I could also use the historic plat maps from Sanborn and Hopkins some which are digitally available (but not georeferenced) from the Cleveland Public Library’s Digital Map Collection and The Library of Congress. The Sanborn and Hopkins maps represent property-level maps of historic Cleveland from the early 20th century and late 19th century. They also include the municipal boundaries on the map. The Hopkins and Saborns provided a tremendous amount of detail that was not available in the 1968 or Volkmann maps and I began using them as my primary references. Going forward as I refine the maps the great detail of the Sanborn and Hopkins maps along with manual verification of the original City Council legislation (the actual true authority) will likely be the best to determine the accuracy and details of the boundaries. I’ve been learning about georeferencing (what is georeferencing) maps for an upcoming project at work to display a print map (24 x 36 inch) where the library provided services circa 1912. My secondary goal for georefencing these maps is to provide a web map layer for users to browse historic Cleveland at a high resolution detail (i.e. at zoom level 19-20). CPL has Sanborn maps. Produced every few years in the early 20th century, Sanborns richly detail addresses, landuse, streets, rivers, buildings, and often times, property owners, of the entire city. Sometimes the buildings usage was also noted. In addition to their utility, they are relatively asthetically pleasing. They’re also available at an extremely fine scale, a scale of 200 feet per inch. These maps were published as a bounded book of ‘plats’/’plates’ - pages - each roughly 15 by 10 inches of an arbitrary geographic area. CPL also have “Hopkins Maps”, made by a different company, but same physical layout and map design. 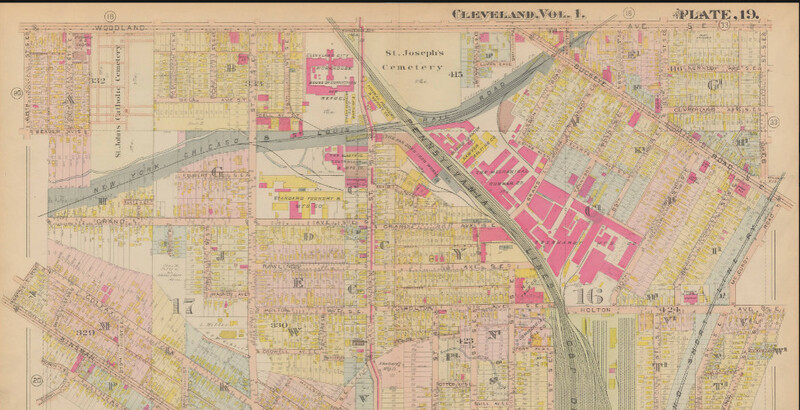 For the city of Cleveland’s 1881 Hopkins maps, there are 40 pages; each image with borders containing extraneous information (page number, map key) and on several pages, contained areas that are also displayed on another plat. Although the LOC will eventually be uploading historic Sanborn maps of the entire country, they have barely started the state of Ohio save for good ole’ (Monroeville). and I didn’t even know what order I should do these steps?! So, how do I do this?! Do I stitch the plat(e)s together first and then georeference them? Or do I georeference first? (In Cleveland, OSM is pretty well aligned (usually within 5 meters) with State of Ohio aerial imagery licensed in the public domain and that is pretty darn accurate [http://ogrip.oit.ohio.gov/ProjectsInitiatives/StatewideImagery.aspx]) So, I has a good reference layer. I spent an hour or so exploring our scanned maps to determine if there were any that, together would provide enough coverage of the city of Cleveland. Some of their metadata and descriptions our digital collections were misleading; this item has the title of Plat Book of Cuyahoga County, Ohio Complete in One Volume (Hopkins, 1914) but if you carefully read the title page of this book and view a couple adjacent pages of it, you learn that it’s just 1 of 4 volumes that are needed to have complete coverage of Cuyahoga County. Unfortunately, we didn’t even have all 4 volumes of the 1914 Hopkins available; so I couldn’t use that as a resource. I finally found a map collection that had coverage of the entire city of Cleveland: a Hopkins book of Cleveland from 1881. So, I started out using the public mapwarper which is really neat. This recommendation maybe different if you’re attempting to use the mosaic feature on there. Lou Klepner reported that Plate Spline is most effective rectifying method on mapwarper; I haven’t noticed definitively one better than the other. For the resampling method, I used cubic spline and didn’t find any noticeable speed delay compared to the nearest neighbor. I then downloaded the geotiffs from mapwarper - now georeferenced that have the geographic projection stored within them - so they can be displayed over other modern maps. Now I can open the geotiffs in QGIS as raster layers. They matched up pretty well although not perfect (ADD screenshot) and I printed a portion out in QGIS’ print composer. And… You couldn’t read the street names on the printed copy. I learned that these image were scanned and uploaded as 72ppi and don’t print well. Oops. Our library didn’t save the original loseless digital scans (they had since corrected this practice several years ago for other scanned maps). So, more searching to see if we had another map set of the complete coverage of the city of Cleveland. Yes, we did! volumes one and two of the 1912 Hopkins of Cleveland. 72 PPI images are publicly available but we had 600PPI of these in private digital storage. I asked Stephen Titchenal of railsandtrails.com - an underrated resource for rail maps of the 20th century; he’s digitized dozens of maps. He admitted he hadn’t stitched together any map as large as I was proposing but recommended photoshop and Panavue image assembler a since abandonwared windows stitcher but he hadn’t stitched together anything as large as I was proposing. Welp. Most of his maps were 300ppi and suitable. Guides by Mauricio Giraldo Arteaga, formerly of NYPL, National Library of Scotland, and Lincoln Mullen are great introductions to the basics of georeferencing with mapwarper but they all assume that you’re only georeferencing one image at a time and not stitching them together. So, readers, I’d love to hear your suggestions and thoughts. Given my two goals (a slippy web map and a print map of 24x36inch) would 300PPI be ok for both? In which order should I complete the tasks of cropping/masking the plates, georeferencing the plates, and stitching them together to appear as one image? After I georeference them, should CPL provide both georeferenced and non-georefenced items in our digial collection? Tentatively, I think I’ll batch convert (with imagemagick) the images to 300PPI; then crop 1-2 plates of them in gimp (if it’s feasible from a memory standpoint), then try to georeference them in qgis. For sharing georeferenced, I can see both sides whether to add the georeferenced ones because georeferencing is never perfect; it’s always a work in progress. I’d appreciate your advice for my next steps and what you’ve learned if you’ve done something similar (email is skorasaurus at gmail, the left bar has my social media contacts). I’ll share what I’ve learned later.